Served cold, this is the ultimate “ready to eat” snack or meal. 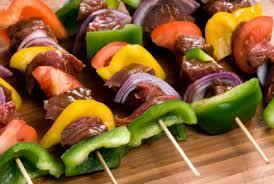 Soak wooden skewers in water for ½ hour so they do not burn. Pierce the above ingredients onto the skewers. Mix garlic and organic tamari seasoning in a small bowl and brush kebabs with mixture. Grill under a medium heat until chicken is cooked through. Tip: Serve with salad or vegetables to keep cold in fridge as a snack.